Betsson Casino will then reward you with a bonus (Welcome Bonus is for new players only). The terms and conditions of the bonuses vary between different casinos and might also change over time and between different countries, so it is important to compare the different offers and read the T&C for Betsson Casino before signing up. Betson was launched in early 2018, so it’s still all shiny and new. It is a full-service gambling website with a sportsbook, casino and a live dealer room. ‘Betsson offers a wide range of first-class online gambling products and games in a safe and user-friendly gaming environment’ – that is the sentence we encountered at the website’s homepage. As far as our experience goes, true words have been spoken. The Betsson brand does not aim to dazzle you with flashy interface and animation. It attracts with style and prestige. BML Group Ltd, a Maltese company, operates Betsson, with experience and consideration for the customers. 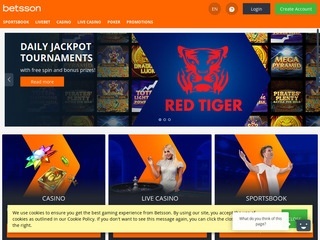 Betsson owns several gaming licenses issued by different authorities so that gambler from various areas could equally access the site and play all the games safely. 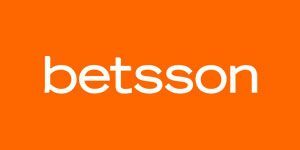 Betsson.com is licensed with the Malta Gaming Authority, the British Gambling Commission and the Alderney Gambling Control Commission. Games from Red Tiger Gaming, one of many suppliers for Betsson, are being licensed and regulated by the Isle of Man Gambling Supervision Commission. Being internationally oriented, Betsson is available in multiple different languages, namely English, Icelandic, Spanish, Greek, Danish, French, Italian, Swedish, German, Turkish, Brazilian Portuguese and even Serbian. As a person that is new to Betsson you will get a 100% match bonus on first deposit up to €100/ 100$. Some countries are restricted from the bonus, so reading the terms and conditions beforehand is recommended. Even though one can’t search the games by provider at Betsson, one look at the front page and it becomes clear that leading manufacturers such as NetEnt and Microgaming are leading the way. Betsson also offers games made by IGT, Play ‘n Go, Evolution Gaming, Red Tiger, Thunderkick, NYX, Yggdrasil, iSoftBet and Leander Games. The full gaming library is packing instant play games, which means the majority of them can be played on mobile phones and tablets. Navigation is crucial when it comes to such a complex website as Betsson, and the developers have resolved it nicely. Spinners have plenty to look forward to by entering the Betsson slots library. A couple of hundred slots are on display, with new titles joining the party as soon as they leave the assembly lines in their respective virtual factories. Besides the standard powerhouse titles like Gonzo’s Quest, Starburst, Motorhead, Book of Dead, Bonanza, King of Olympus and Gladiator, players at Betsson can enjoy a limited range of Betsson Exclusives, some classic slot machines and also jackpots. Betsson Exclusives include extremely rare titles such as The Untouchables, Rocket Money, Alice Cooper and Coins of Egypt. For those who are more in the mood for simple fruit machine action, the options include Jackpot 6000, Ivanhoe, Mega Joker and Classic Fruit, among others. Table games are casino classics, a must. Betsson has a satisfying range of card games and roulette variations, seasoned with attractive rarities like 3 Card Brag, Pai Gow and Beat Me. Some of the more recognisable titles are Casino Hold’em, Roulette High Stake, Single Deck Blackjack Pro and French Roulette. There is only one version of virtual baccarat, Baccarat Pro which can be played at low, medium and high stake. Scratch tickets are all presented on one page. There are quite a few of them. Bingo games seem to be divided into the pages belonging to scratch cards and other games (which are mostly video poker games, anyway). If scratchies are your thing, you’ll find games like Robin Hood Prince of Tweets, Diamonds and Rubies, Shore Thing and Pot Luck at Betsson. Pretty much any video poker machine is available, as well as some cute keno and mini games. Betsson’s live casino is something to write about. Powered by Pragmatic Play, Evolution and NetEnt, this section of the site is the one that maintains the true casino atmosphere and sending casino vibes through your screen. Elegant croupiers are standing by the tables, waiting for your bet – will you play Lightning Roulette, Exclusive Blackjack, Dragon Tiger Baccarat or Ultimate Texas Hold’em? Banking is resolved at Betsson with a comprehensive list of efficient, easy-to-use payment methods the audience is used to and feels comfortable using. You can make deposits with Visa, Skrill, Neteller, PaysafeCard, Entropay, MasterCard, ecoPayz, PayPal (for Germany and the UK), Boleto and bank transfer. The majority of the methods can support withdrawals too, and they can take from 24h to 5 working days to complete. The help centre at Betsson is high-end. It involves a detailed FAQ page, the opportunity to request a call back (response time 15-60 minutes), engage in live chat (response time 30 seconds) and resolve your issue through email correspondence (email response time 30-60 minutes). Betsson won an award for Best Customer Service Operator at the EGR Operator Awards 2017.